Burglary is one of the most commonly committed property crimes, as this statistically leads to some of the least arrests, with 2016 estimates stating that a mere 13.7% of all reported break-ins resulted in an arrest. Security cameras are not only the key to catching burglars but also represent the best form of prevention. Unlike motion detectors and alarms which only frighten, startle or automatically contact authorities, cameras can be used to identify perpetrators. Wi-fi cameras represent the cutting edge of home security technology, allowing for great versatility and constant vigilance. You can be notified of activity anywhere you are, no matter how far away from the camera itself. Many models come with smartphone apps letting you watch the feed in real time from your mobile device, and they automatically send you notifications whenever activity is detected. Beyond the benefit of providing tangible evidence and giving criminals pause, Wi-fi cameras fulfill the role of less sophisticated devices. Your Wi-fi camera can work as a PA system, and it functions as a motion detector. Cameras can be equipped to ‘see’ under any condition, such as low-light, during storms, or even detect heat through cover for maximum security – though don’t expect most mid-range consumer models to pack all of this functionality. Cameras can offer the best level of security any individual homeowner could require, acting as a prime deterrent to break-ins whilst also forming the backbone of any home security system by providing the most information among detection devices. Live feeds and recordings are both essential for security, and on the off chance that something does happen, can ensure that you get back your property. The things buyers should look for when considering a camera to buy usually center on performance, however there are other, less prominent features and factors which can inconvenience you if you’re not paying attention. The most apparent feature of a camera is the camera element itself. How wide is the cone of vision, what is the resolution, does it have different modes, is it suitable for outdoor use and so on. You’ll be wanting to grab cameras with the widest possible angle of vision, as that way more area can be covered with fewer devices, saving you some cash. With cameras, we can’t really talk about “range” since they detect all light entering the lens, no matter how far away the object that reflected it is. However, an analogy for range is resolution, since the higher the resolution, the clearer far-away objects are, allowing for easier identification if need be. Low-res cameras can be called “short-sighted”, and taping grandpa’s reading glasses to the thing won’t help. Following the camera itself, the device’s other features come to mind. Live-feed streaming is a massive plus, as it allows you to track the happenings around your property anywhere in real time. If you have an alarm system hooked up, for example, and it’s triggered and notified you remotely, instead of rushing to the location you can just switch to the camera and see whether it’s a real break in, or if it’s just your pet traipsing around where they shouldn’t. Additional features which greatly increase value and versatility include motion detection. In some cases, the camera may be set up in such a way as that whenever it detects activity, it sends the user a snapshot onto their devices via e-mail or app. Some advanced systems even allow for the configuration of active zones. If a busy road falls into the camera’s field of view, everything except that can be identified as an active zone so that you don’t get an image every 3 seconds during peak traffic. Storage is also a major factor. Are recordings saved at all? How long? Naturally the best configuration will allow each user to personally define for how long recordings should be kept, and these days many Wi-fi cameras allow for the use of cloud storage, meaning you get to keep your recordings even if the device malfunctions or is tampered with. Speaking of tampering, while it is very rare for intruders to attempt to damage a camera system in some way, it’s always better to err on the side of caution. While booby trapping your cameras might be a little too much, and illegal, there are ways to either prevent tampering or secure some kind of backup. Connectivity is another factor that you should keep in mind. As the name implies, most Wi-fi cameras rely on a wireless internet connection to keep you updated, however some models offer a wider range of options. Home automation enthusiasts may want to look for models with Z-Wave compatibility to hook the camera up to their existing internal system. This way the functionality of the camera is expanded beyond being merely a security device, becoming another cogwheel in a vast machine. Finally, the aspect many users fail to scope out before making a purchase – and this can often be blamed on the unclear descriptions provided by manufacturers – is whether the devices are tied to obligatory paid services. Many a device has received negative reviews because the product page boasted 10 days of recordings stored in the cloud, live-feeds and more, but when the customer got the device to hand, these features were locked behind a yearly subscription service costing $100 per device. Research is key if you want to get the device that works best for both your requirements and your wallet. Saving the best for last, the Amcrest IP2M wi-fi security camera manages to take all of the features of the Foscam R2 and offer even more at the same price range. The IP2M’s 90-degree camera angle is the only stat which lags behind the R2, but with a remotely repositioning dome camera, that particular aspect loses much of its importance, since the potential coverage is the same. It does, however, improve on the formula with a longer night-vision range and a free cloud storage plan. Stop me if you’ve heard this one before: remote repositioning. You know the drill, maximum coverage, automatic control from the app, etc, etc. This device also has 2-way audio so the whole scaring-the-burglar-away thing is still applicable too. Many of the features the IP2M boasts are the same as the R2, with motion detection, smart recording, 1080p resolution and 2-way audio, so instead we’ll focus on what is different. In terms of night vision, the IP2M leads the pack with a 32 ft range of clear footage, beating the R2 by a small factor. As for storage, the IP2M is also hybrid, with a micro SD slot and NVR compatibility, however Amcrest’s cloud storage service offers 4 hours of free recording, with additional paid plans in case you feel that isn’t enough. 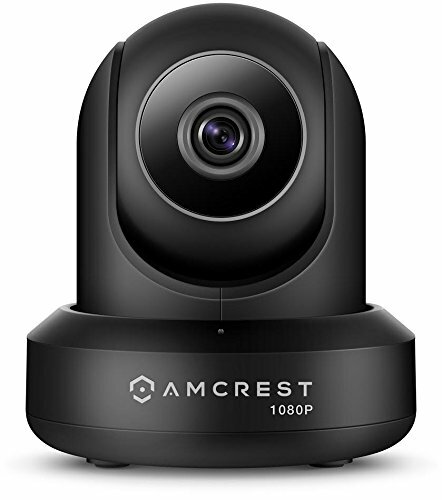 The Amcrest IP2M combines everything we think is necessary for the ideal wi-fi security camera. It packs all the essential features with a few bonuses and one-ups pretty much every other device in terms of raw statistics. On top of all this, these benefits are provided with a very reasonable price tag. It also stands out in the non-crucial fields – the design of the device is also the best among them all. This device is one you’ll definitely want watching your back. Packing all of the bonuses that every device we’ve looked at has, without any of the significant drawbacks, whilst keeping the price relatively low, elevates the IP2M above all of the others. 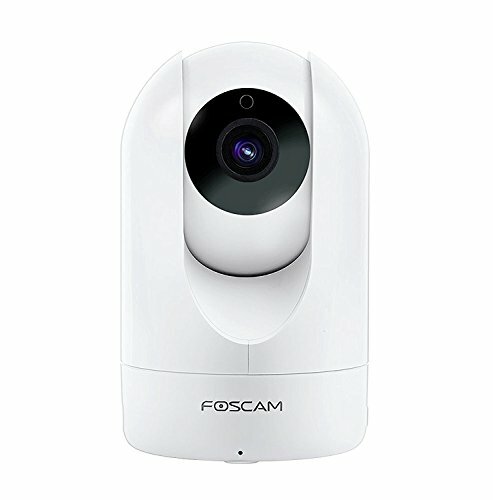 The Foscam R2 does everything all other dome cameras that we’ve reviewed do, but ups them with additional functionality all for just a slight price hike. With a much more premium build quality than most others, more accessories and better stats across the board. The camera resolution of the R2 is 1080p, and the program of the application is far more sophisticated than that of most competitors. The R2 also allows for hybrid storage, with both a paid cloud service and local recording on micro SD cards or even NVRs. Once again, the Foscam R2’s strength lies in its mobility. The camera itself has a field of view of 110 degrees, but that is augmented with a 300 degree horizontal and 100-degree vertical rotation, which can be controlled remotely from the application. In addition to the remote repositioning, the device has an 8x digital zoom feature, allowing you to close in on anything that catches your eye. Joining remote repositioning and zoom are additional features such as two-way audio capabilities. The device can be co-opted as a PA system, however the most appealing benefit here is, as previously highlighted, the ability to startle intruders before significant property damage is inflicted. The Foscam R2 boasts night-vision range greater than the average, with 26ft of crisp visibility in pitch black conditions. It also self-adjusts to lighting conditions, and has been configured to filter out false motion detection alarms, such as ambient motion or the swaying of plants in the wind. The application to control the R2 is highly versatile, and this device is the only one that we reviewed which features audio detection notifications. If a significant sound is detected, but the source is outside of the view field, you’ll still get a notification (based on preferences). Overall, the Foscam R2 is a fantastic device which nails every feature we look for, and does so without inflating the price to a premium. This little device is as useful as it’s droid namesake in that one really popular sci-fi franchise. Superb Video Quality: 1080P FHD resolution @ 25fps plus a 110° wide viewing angle and 13 IR-LEDs (for night vision up to 26 feet) allow for a super clear image 24/7. Advanced WDR: Automatically corrects dark faces under strong or heavy light to offer a more balanced image. Ambarella chipset and LBR encoding ensure a superior video experience. Smart Technology: Motion detection and intelligent alerts can provide real-time push notifications with captured images (Rich Media Message Push) via smart phone while you're away. Zmodo, as a manufacturer, has an exceptionally wide range of wi-fi camera products available, however this full kit which contains a total of eight cameras for both indoor and outdoor coverage is their most complete package and can be a one-stop solution for home security. Considering all the content in the kit, the price is quite generous. The kit contains 4 indoor cameras, 4 outdoor cameras and a 500 GB hard drive enclosure which functions as a network video recorder. The two variants of camera differ in many aspects, including form factor and durability, however both kinds have a resolution of 720p and work at night as well as they do during the day. The Zmodo system all links up with a mobile application allowing for real-time streaming of footage and the playback of recorded video. Currently the company has no cloud storage service, but have recently concluded a testing phase of such a service which will be launched sometime in the near future, though you’ll need to pay a subscription fee to use it once it is available. The most attractive aspect of this kit is definitely the convenience. Setting it up is easy, and you have a full system in a single product. You’ve got outdoor coverage, indoor coverage and recording all wrapped up in one easy solution. The cameras all connect to the NVR device which can be configured from the mobile app, and footage can be viewed from anywhere with a network connection. This is the go-to device for customers looking for an easy solution without breaking the bank, so long as they don’t mind the lack of a few otherwise common features. The outdoor cameras have been designed to take the beating of rough weather like a champ and will keep functioning even under poor conditions. All cameras have motion detection capabilities, and if the NVR is set to smart recording, the framerate of the footage will be below 1 whenever footage isn’t detected to significantly conserve storage space. Lacking cloud storage, this is a boon. The indoor cameras have a dome form-factor and can rotate 115 degrees horizontally and 90 vertically, though this must be manually done, as it lacks the internal motors to achieve this remotely. The outdoor cameras are of a bullet form factor and are housed in a tough casing. Neither variant of camera has any kind of audio capability whatsoever. The Zmodo home security kit is a full entry-level solution for users who don’t want to fiddle with various different products, but don’t mind relying on a system that lacks some of the functionality other models offer. However, for users looking for more advanced hardware, this kit would be lacking. Easy and quick setup-zink.Power the camera and NVR, one click to complete the network configuration.Connectivity: IP/network-2.4GHz wireless(incompatible with 5GHz). Always stay connected -seamlessly stream video via the mobile Zmodo app for iOS and Android or via internet browser on user.Zmodo.Com. Receive intelligent motion alerts when motion detected. 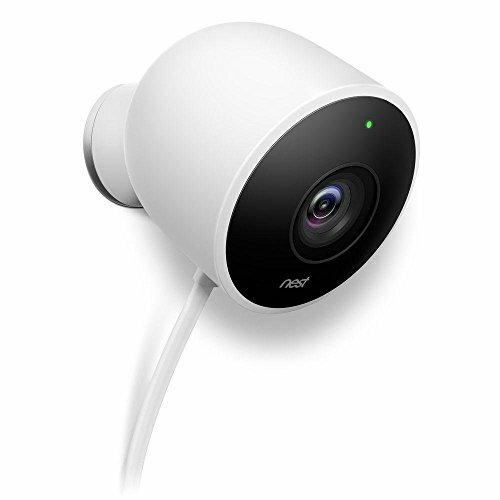 Nest Cam’s outdoor variant represents one of the higher-end models on the market, both in terms of price and functionality. The device packs a lot of punch into a relatively tiny form factor, offering some great stats and functionality which most cheaper models lack. Each Nest Cam functions standalone, so they’re not tied to some kind of hub or receiver unit, so technically if you only want to keep an eye on, say, your front door, you can have the whole thing done with a single small device instead of hooking up various boxes and wires. Nest Cam connects through your home network’s Wi-fi and can be directly connected to a PC via USB, though this mode is mostly used for setup, not actual function. There is a mobile app that allows for remote viewing of the camera feed, and notifications can be set up too. This device falls into the category which is tied to a subscription service but doesn’t make it clear. Buying the camera will get you a limited trial run of Nest Aware, however once the trial period is up you’ll have to pay $100 per year, per camera for the cloud storage of 10 days worth of recordings, and $300 for 30 days worth. Nest Aware also boasts additional useful features like active zones, and less useful ones like the ability to share time lapse video clips on social networks. If your camera will be pointed, even partially, at a street or road, your sanity might demand the subscription if only for the active zones. The main draw of the Nest Cam is how versatile and reliable the camera itself is. With 1080p HD resolution and a wide 130-degree field of view, this home security camera covers a lot of ground. That vigilance isn’t interrupted by nightfall either, as the device is equipped with 8 infrared LEDs. The sensor itself is 3 megapixel and features 8x digital zoom. The high-quality footage and crisp images this camera produces have often been the main topic of discourse among users, with many praising its night-vision capabilities as well. The Nest app will allow you to view the live-feed directly on your smartphone, and you can set up either e-mail or push notifications for whenever the cameras detect motion. The camera can also differentiate between people and any other moving object, sending special alerts whenever a human is detected. In addition to capturing great video, the Nest Cam also excels in the field of audio. The microphone on this home wi-fi camera has surprising range, with some users reporting that they can clearly hear conversations from neighboring houses – not that eavesdropping is recommended. Additionally, the camera can be used as a PA system with a loudspeaker connected to the application. No matter how far away you are, as long as you’re online, you can speak into your phone and the Nest Cam will relay your voice, whether you want to creep out intruders or tell Rocket to get the hell off the couch for the hundredth time. The Nest Cam Outdoor is designed to be weatherproof. The strong, water-tight housing prevents any of the internal workings to be damaged by the whims of mother nature, and video quality isn’t impeded by rain and wind either. Naturally you’ll see less in a full-blown blizzard, but no camera can see through that. Unless you live in extreme conditions, temperature won’t be an issue either. Officially the operational range is -20 Celsius to 40 Celsius, but in practice you can add about 5 in each direction. Installing this wi-fi surveillance camera will be easy, and you won’t require neither specialist knowledge nor tools. It has a self-adhesive mount which is also magnetic, making installation on metal surfaces even simpler. The cord is comfortably long so the outdoor socket placements won’t restrict you too much, and in case you want to drill a hole to access indoor sockets, the package comes with a shield-plug to prevent gaps. Nest Aware as a service may be pricey, but to be fair it does offer a lot of functionality. Active zones are a massive plus, and the storage of recordings is a boon to security. Geofencing is also locked behind the paywall, and this can be used to automatically activate the camera’s alert mode when it sees you leave home. The other features, like social media sharing, is just fluff, but some users might enjoy playing around with them. The Nest Cam Outdoor is, in terms of functionality, an industry leading device. With some of the best features and a nice, small form factor, it’s easy to think that this might be the best choice for everyone equally. However, the really expensive subscription service which locks most essential features behind a paywall can be off-putting for those users who don’t want to deal with additional fees. Netgear’s Arlo wi-fi camera likes to open with the feature it will rub into your face as much as it can whenever you read about it: it’s the “only” truly wireless wi-fi security camera, relying on battery power instead of an AC socket. Since it’s the first thing the manufacturer brings up, it will be the first thing we address too: it isn’t true. Granted, truly wireless, battery powered wi-fi cameras are few and far between, but the Arlo isn’t the only one of these. Now that we have that out of the way, let’s talk about the camera itself: this is a tiny cloud-enabled motion tracking camera designed for both outdoor and indoor use, meaning it can resist the elements if need be. Recording can be set to kick in whenever movement is detected, however the device lacks some functions that the price would have us expect would be included. Setting up the cameras is a breeze and the video they provide is crisp. 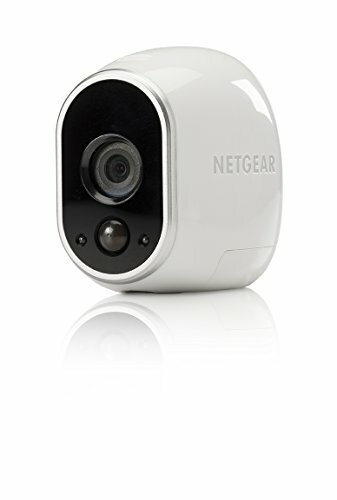 The resolution is 720p but the image quality stands out among cameras with the same resolution, both during the day and at night, and these wi-fi security cameras offer great range too. The kit includes a receiver and, depending on the package, one or more camera units. At any given time, one base can record and stream footage from 5 cameras, which is also the limit of the free cloud service plan. More cameras can be linked to a base, but you’ll need to select 5 “active” ones through the app. More cameras and bases can be linked to the same account through paid plans, however you can always make additional accounts. While the wire-free build has its advantages, the drawbacks seem to be more numerous. The device has no audio functionality at all, meaning no audio recording and no loudspeaker. Additionally, there is no way to pan, tilt or zoom the camera remotely, but you need to physically reposition it yourself. While somewhat embellished, the complete lack of any cables is the biggest strength of the Arlo camera. Each camera uses 4 batteries for function, though if you prefer running on cable power, each has a micro USB port. Mounting the device is easy, as each mount can be placed without the used of tools on most surfaces, though screws are included for a more secure installation, or in case the drywall anchor doesn’t work for you. The camera units have a magnetic base, with which they connect to the mounts or to any magnetic surface. This allows for complete coverage, allowing cameras to be placed in locations far from any power source. The Arlo security camera is designed to allow for outdoors usage, meaning it is weatherproof and boasts night-vision. Customers have indicated that in spite of its small size, this camera won’t be swept away by winds, is suitably durable and provides clear video during the night. The cloud storage service for the Arlo Security System offers a free plan, which includes support for up to 5 cameras, one base, 7 days of recording, 1 GB of storage and motion detection notifications. There are additional plans which accommodate more cameras, bases, days of recording and storage capacity. The motion detection capability of this camera has been called into question, as users report recording lag between 5 to 20 seconds, meaning that time passes between the detection of the motion and the actual beginning of the recording. Additionally, the maximum amount of time that can be recorded is 120 seconds, but the factory setting is 10. An annoying quirk of the system is that the same amount of seconds must pass in between each recording as many were recorded, meaning if the device records for 10 seconds but still detects motion, an additional 10 seconds without recording must pass before the next 10 are recorded, and the same applies to the 120 setting. Some users have also expressed annoyance at the video player used by the Arlo application, which has no seek function, meaning you can’t jump between timestamps at will. The Arlo Security System banks on a single feature which isn’t exclusive to justify a steep price in the face of many fundamental flaws, which we can’t look past. While the camera itself is of excellent quality in terms of video output, too many other devices which similar stats boast far more features at lower prices for us to wholeheartedly recommend this device. The UOKOO Home Security Camera is a dome-type wi-fi security camera designed for indoor usage. 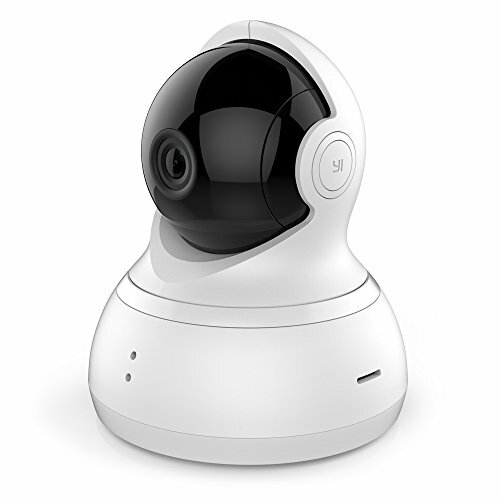 This device is pretty much the same fare as the Yi Dome camera, but without the nightmarish privacy concerns. The 720p camera packs quite a lot of features at a decent price point and is easy to set up. As a dome camera, the coverage provided by a single device is greatly increased, especially when it allows for remote repositioning. Solidly built, the UOKOO dome camera has received many favorable reviews with few issues popping up consistently. Something to look out for is many users find that they can only access the device from the mobile application when connected to the same wi-fi network. This isn’t a shortcoming, it’s simply a matter of setting things up correctly. A simple tweak in the options and you could even access the footage from another continent. This camera shares its main strength with most dome cameras. The vastly greater potential coverage area is a massive boon allowing for users to blanket the desired area with fewer devices. Of course, this is only effectively a bonus if the dome can be repositioned remotely, which in this case, it can. The camera features a full potential coverage area of 355 degrees, and you can control the device using the mobile app. Couple this with the 2-way audio system and you can give intruders one good scare depending how good your Sauron impression is. The device features discreet night vision capabilities facilitated by IR LEDs, not unlike most other products we’ve looked at already. Additionally, as mentioned above, there is both a microphone and a loudspeaker built into it. The UOKOO Home Security Camera can be configured to notify you via push notification or e-mail when motion is detected, as well as trigger recording in such an event. Said recording will be stored on an SD card inside the camera’s casing. While UOKOO provides no cloud services, the desktop application can be configured to save recordings on the PC’s hard drive, which provides for additional security, though not as secure as cloud storage would be. An interesting feature of the UOKOO dome wi-fi security camera is how pairing is achieved. When the mobile app is downloaded onto a device which is connected to your wi-fi network, the app translates the password string into sounds, which the device then plays back. The camera, using the microphone, translates those sounds back into the password and connects to the wi-fi. 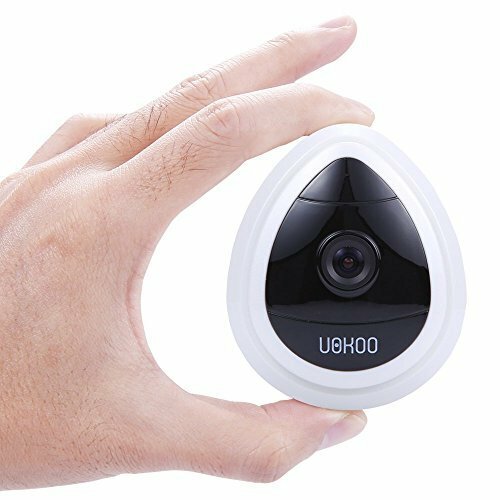 The UOKOO dome camera is a great choice overall, packing great features for a great price, with the lack of cloud storage standing out more or less as the only issue. This device didn’t make it to our #1 spot not because of its flaws, but because there are others which are better. That said, at this price point, this is the best you’ll get. The Yi Dome camera is a highly functional device for its price, offering a heavy hitting package of features on a budget. As a dome camera with two axes of motion, the potential coverage of each device is immensely amplified. This IP security camera connects with the manufacturer’s proprietary application to allow for monitoring and control, whilst also keep you up to date on any activity alerts. With the Yi Dome, you’ll be able to cover a greater area with fewer devices due to the mobility. Instead of installing two fixed cameras at the corner of a turning corridor, a single Yi Dome can offer full coverage. 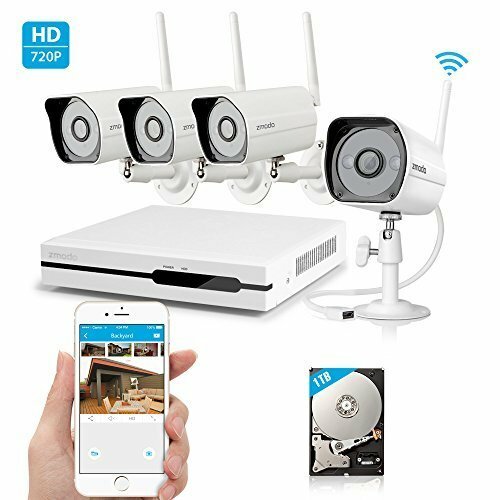 Considering this wi-fi security camera boasts all of the features most other devices do with the added bonus of mobility, all the while being a cheaper option. So why isn’t this a best seller, and why isn’t every home on the planet equipped with one of these? The low price comes at the cost of a mere 30-day warranty and a reputation for malfunctions, and the proprietary app demands permissions to literally everything from contacts through call logs and browsing history, to the point where many antivirus programs flag it as a data-mining worm. 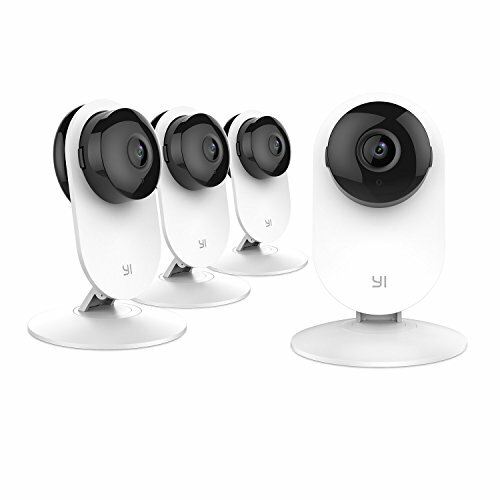 Without a doubt the biggest bonus here is the 345-degree horizontal and 115-degree vertical rotation, which can be controlled remotely using the Yi Home application. You can program up to 8 hotspots within the full field of coverage, and the Yi Dome will periodically focus and center on each of them in sequence. The device also makes automatic use of this mobility. Whenever motion is detected, it automatically zones in on the disturbance and even tracks the moving target. If an intruder is afoot and the user decides to warn them through the sound system, that vocal stimulus paired with the fact that this thing follows their every move will likely prove to be unnerving enough to send the poor sod running. While relying on a mobile camera to cover a larger area than its real field of view (which is 112 degrees) might provide a security risk, the video-game-esque scenario where the dastardly intruder will scope out the time-frame needed to get through a temporary blind-zone is unlikely to actually happen. The camera used by the Yi Dome records at 720p and is equipped with 8 LEDs for night-vision that provide 3-meter visibility in pitch black conditions. The LEDs are infrared, so they don’t actually glow – meaning they don’t give away the camera’s location at night. This wireless IP camera has a two-way sound system with a loudspeaker and a microphone. You can use the application to speak through the intercom, which comes with two settings: the first works a bit like a walkie-talkie, with the person using the app controlling when the microphone is active and when the loudspeaker is active (we don’t really see much use to this) and another where both are active simultaneously. The device has on-board storage via microSD which will record as long as there is free space on the card. Whenever the camera detects motion, it will send a 6-second video snapshot as a notification to the application, which is a neat feature compared to most devices only sending a still. Many manufacturers operate a paid cloud storage service, and Yi is no different, with one key advantage – there is a free plan. Without paying any additional fees, you can store up to 7 days of recordings in the Yi Cloud. There is a paid plan for 15 days of footage, however where most other services have you pay per device, up to 6 devices can be linked for the same base fee with additional costs only being added after the 7th. The Yi Dome seems like it’s the dream wi-fi camera on paper, but in practice, things are less glamorous. When it works, the Yi Dome lives up to expectations, but there is a high chance that it won’t work for long, and even when it does, you’re surrendering all of your personal information to the company, which is a definite issue. This particular model of wi-fi security camera is a small, unassuming device. Intruders might very well mistake it for a webcam based on the design. It packs a 720p wide-angle lens and has 4x zoom capability which can be controlled from the application, which is the same standard Yi app that controls all of their products. It’s also really, really cheap. Invasive spyware notwithstanding, this camera packs a surprising number of features for a really small price tag. Many more expensive models don’t have things like 2-way audio capability or encryption for locally stored footage (because if the company already has access to it, at least prevent the burglars from accessing it too). It doesn’t require any additional devices to function and can be set up in a breeze, thus it has all the trappings of an impulse-buy camera. As mentioned above, the Yi Home Camera has a microphone and a loudspeaker allowing you to communicate with anyone within earshot of the camera while you’re away through the application, further reinforcing the webcam-like properties of the thing – just keep in mind that big brother is listening. IR LEDs provide for unobtrusive night-vision, so you can rest easy knowing that our benevolent corporate overlords are watching you sleep. This model doesn’t support cloud storage but has onboard recording capabilities facilitated by micro-SD cards. The videos are encrypted upon being saved with passwords configurable through the application. As the device has motion detection capabilities, you can set it to only record when said detector is tripped. Installation is easy, if limited. It has a stand, allowing you to place it on any flat surface, however there are no mounts included, so your options in terms of placement are a restricted. Of course, this way you can use the design of the thing to your advantage and disguise it as a harmless webcam with seemingly no power in a potential future court hearing. While this device packs a decent list of features for a very attractive price, we can only truly recommend this to the kind of people who would take some sort of perverse pleasure in having their lives observed by a Chinese corporation. A recurring theme you might have noted is how we placed dome cameras above other types, and this can be attributed to the greater coverage. However, comparisons notwithstanding, stationary devices are just as adept in their goal to scare away intruder. Usually the mere presence of the camera is all it needs to do in order to get the job done, and all the bells and whistles are there in anticipation of the very rare case when it will actually record a crime. While we didn’t include these factors in our reviews since they’re not a straight scientific factor, there are signs that you can catch early of sub-par devices. Look out for discrepancies in product descriptions – the text claims 1080p but the specs show 720p, for example, pay attention to the grammar (we’re not joking), and if the device has “US version” in the name somewhere, that probably just means you’re buying the generic version at a higher price.